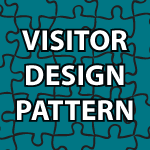 Welcome to my Visitor Design Pattern Tutorial! This is the last part of my design pattern video tutorial. The Visitor design pattern allows you to add methods to classes of different types without much altering to those classes. You can make completely different methods depending on the class used with this pattern. With both the video below and the code that follows you should be able to start using this pattern in your code easily. Good job!! code and video together is a nice approach, thanks. Thank you so much for the video! You cleared up A LOT for me. Thanks for the effort that you are putting to create all these videos and articles which are very informative. Can you also consider creating articles/videos on Core J2EE Design Patterns which also would be very helpful for many, across the world? Thanks For all the videos..Very Informative..Removes any confusion..
cant wait to look over all of these videos..im excited! In the VisitorTest class you have called the appropriate methods by milk.accept(taxCalc) but that can be also called like taxCalc.visit(milk/vodka/cigars) or taxHolidayCalc .visit(milk/vodka/cigars) then what is the advantage here? Fantastic video on design patters. Made me understand the patterns in detail . Great job ! Are you also gonna make tutorials on Frameworks Like strut or spring and hibernate/JPI for developing enterprise level applications??? Yes I will cover this topics after I finish teaching how to make Android apps and games. Hi Derek, thanks so much for all these videos! greatly helping me 🙂 is there a package with all source codes from the design pattern videos? Yes it did, I actually packaged all except one. If you ever want to add subtitles to your videos, I can provide Hebrew. Thank you for the subtitle offer. I’d do that if I could find an easy way to do it. I have been writing transcripts for all of my recent tutorials. I’m not sure if they help or not though? I’ve been learning so much from these design patterns videos and thank you so much for it ! The content is just great ! As for this visitor pattern example, the visit() and accept() methods have a ‘double’ return value. But doesn’t that restrict the kind of future-operations that could be added ? A few other examples that I went through have the visit() and accept() methods as void-methods and store the results in instance variables within the visitor. This second approach looks to be more flexible. in each of those Visitable classes. That is a very good point and I agree with you. The only reason why I locked them down and removed flexibility was for tutorial reasons. I have to constantly think about 2 things when I’m making these videos. First I need them to be accurate. Secondly I need them to be as easy to understand as possible. In my mind making something easier to understand normally forces me to make code that is less flexible. That is a shortcoming that I’m working on. That is why I constantly try to improve and I very much welcome great insights like you have provided here. I went through couple of videos of design patterns and OO design.And as you said in one of the videos i absolutely agree with you saying nobody does this kind of videos on you tube. i have a request though if you can do TDD in similar lines of OO design, that would do world of good. As i thought you would be the best person to do such stuff once i saw your OO design videos. please take a use case / user story and if you can cover end – end like how you design and related thought process before you start with initial test. as i browsed a lot and see no body as ever provided such videos on TDD. every body say a problem and show the tests. but no body tell what is the design / thought process lead them to write such tests in front. hope i didn’t confused you. and thanks a ton for all you work. I did my best to explain test driven design in my Object Oriented Design tutorial. Of course it doesn’t really work unless you get a bunch of people in a room in front of a white board and work through the “Real World” process. I have been trying to get people to allow me to video tape that process. As I’m sure you know it mainly involves people throwing out ideas and then we run to our computers and work them out. Then back to the white board over and over again. It is a ton of fun if you are on a good team. Sorry, but I’m not very good in regards to Indian cooking. I only know how to make a Green Curry with Eggplant. It is delicious to me, but I’m not sure if it is very accurate. Great tutorials, thank you very much! Is there any reason why the Visitable isn’t an abstract class holding the visit method? Thank you 🙂 Visitable is a interface because I want to force those classes that implement it into creating the accept method.